Slots progressive jackpots in both online and land-based casinos. The principles of progressive jackpots and the odds of progressive slots. 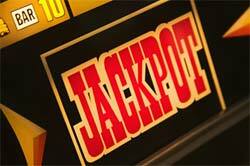 It is very easy to hit really big jackpot playing slots because of the slots progressive jackpots. This article gives more information about slot machines progressive jackpots. Most people know how traditional slots work. Every game pays out according to the symbols and has its own pay table. Slot machines with progressive jackpots have pay tables which work by the same principle. Individual Slot progressive jackpots grow exclusive of every game. Jackpots in linked banks slot machines are based on the bets which were wagered on the previous games within that bank. And progressive multi-location networks jackpots can be shared between multiple casinos. So, you can see that progressive jackpots continue to grow until somebody hits it. Every player makes the contribution to the one big jackpot which can be of several millions. Online Slots with Progressive jackpots work by the same principle as their land-based counterparts. There is no Slot machines bank or network. Everything occurs online. Some online casinos have some specific Slots with a perpetually-growing jackpot. In some cases several online casinos can use one software on one gambling site and pool all slots together in such a way for one huge progressive jackpot. So, a progressive jackpot can be available to gamblers of several online casinos. First of all let's distinguish one common misconception: any slot machine payouts depend on the previous games and payouts. It is not true. The odds of winning the jackpot (the progressive or some other) are the same because of the Random Number Generator. The hitting of the jackpot depends on the symbols' numbers per reel. In general, it is based on math, not on the previous games.